Definition at line 42 of file llframestats.h. Definition at line 46 of file llframestats.h. Definition at line 86 of file llframestats.cpp. References FALSE, mCurrentStat, mFilename, mStopTime, mTrackStats, mUseTimer, and NUM_STATS. Definition at line 96 of file llframestats.cpp. Definition at line 120 of file llframestats.cpp. 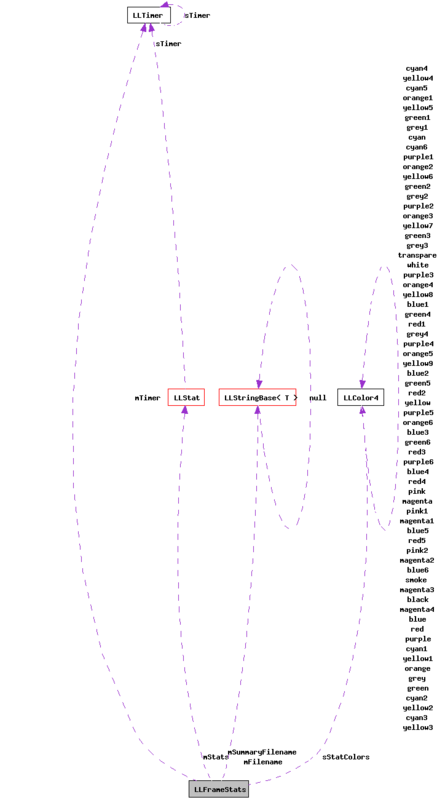 References FALSE, LLStat::getCurrentDuration(), LLTimer::getElapsedTimeF32(), LLViewerObjectList::getNumObjects(), LLPipeline::getVisibleCount(), gFullObjectUpdates, gObjectList, gPipeline, gTerseObjectUpdates, i, llendl, llinfos, mCurrentStat, LLFrameStats::FrameData::mDuration, mFrameData, LLFrameStats::FrameData::mNumFullUpdates, LLFrameStats::FrameData::mNumObjects, LLFrameStats::FrameData::mNumTerseUpdates, LLFrameStats::FrameData::mNumTriangles, LLFrameStats::FrameData::mNumVisibleObjects, mStats, mStopTime, mTimer, LLFrameStats::FrameData::mTotalDuration, mTrackStats, LLPipeline::mTrianglesDrawn, mUseTimer, NUM_STATS, S32, and setTrackStats(). Definition at line 163 of file llframestats.cpp. References LLFile::fopen(), gDirUtilp, LLDir::getExpandedFilename(), i, j, LL_MAX_PATH, LL_PATH_LOGS, llendl, llinfos, mFrameData, mSummaryFilename, NUM_STATS, S32, and sStatLabels. Referenced by disconnect_viewer(), and setTrackStats(). Definition at line 313 of file llframestats.cpp. Definition at line 85 of file llframestats.h. Definition at line 87 of file llframestats.h. Definition at line 86 of file llframestats.h. Referenced by getCurStatName(), and LLFrameStatView::setup(). Definition at line 72 of file llframestats.h. Definition at line 73 of file llframestats.h. Definition at line 256 of file llframestats.cpp. References dump(), llendl, llinfos, mFrameData, and mTrackStats. Referenced by addFrameData(), saved_settings_to_globals(), startLogging(), stopLogging(), timedLogging10(), timedLogging30(), and timedLogging60(). Definition at line 101 of file llframestats.cpp. References mCurrentStat, mStats, LLStat::start(), and stop(). Referenced by display(), idle(), and LLPipeline::renderGeom(). Definition at line 279 of file llframestats.cpp. References gFrameStats, setTrackStats(), and TRUE. Referenced by init_client_menu(), and LLAgentPilot::updateTarget(). Definition at line 108 of file llframestats.cpp. References LLStat::addValue(), mCurrentStat, mStats, and NUM_STATS. Definition at line 284 of file llframestats.cpp. References FALSE, gFrameStats, and setTrackStats(). Definition at line 305 of file llframestats.cpp. References gFrameStats, mStopTime, mTimer, mUseTimer, LLTimer::reset(), setTrackStats(), and TRUE. Definition at line 297 of file llframestats.cpp. Definition at line 289 of file llframestats.cpp. Definition at line 119 of file llframestats.h. Referenced by addFrameData(), getCurStatName(), LLFrameStats(), start(), and stop(). Definition at line 111 of file llframestats.h. Referenced by LLFrameStats(), and setFilename(). Definition at line 124 of file llframestats.h. Referenced by addFrameData(), dump(), setTrackStats(), and ~LLFrameStats(). Definition at line 121 of file llframestats.h. Referenced by addFrameData(), getStat(), start(), and stop(). Definition at line 117 of file llframestats.h. Referenced by addFrameData(), LLFrameStats(), timedLogging10(), timedLogging30(), and timedLogging60(). Definition at line 112 of file llframestats.h. Referenced by dump(), and setSummaryFilename(). Definition at line 115 of file llframestats.h. Referenced by addFrameData(), timedLogging10(), timedLogging30(), and timedLogging60(). Definition at line 114 of file llframestats.h. Referenced by addFrameData(), LLFrameStats(), and setTrackStats(). Definition at line 116 of file llframestats.h. Definition at line 123 of file llframestats.h. Definition at line 122 of file llframestats.h. Referenced by dump(), and getStatLabel().